In a video published by the newspaper, Nirav Modi is seen in the streets of London, trying to hail a cab, and repeatedly saying "Sorry, no comment" to questions put to him by the journalist, Mick Brown. 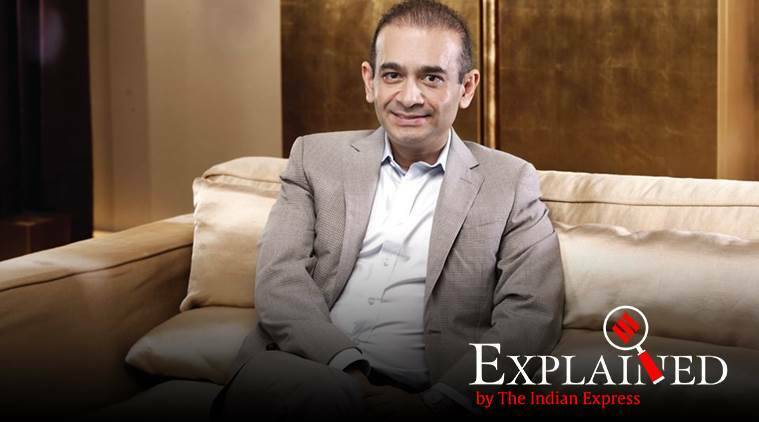 Fugitive jeweller Nirav Modi, a key accused in the Rs 13,500 crore PNB scam, has been interviewed by the UK newspaper The Telegraph. In a video published by the newspaper, Modi is seen in the streets of London, trying to hail a cab, and repeatedly saying “sorry, no comment” to questions put to him by the journalist, Mick Brown. Modi is wearing a dark jacket that subtitles in the video say is “made from ostrich hide”, and “would have cost at least £10,000”. At the end of the 2-minute, 13-second video posted on The Telegraph’s Twitter handle, Modi gets into a cab and leaves. Interpol red notices and extradition requests from the CBI and ED are pending against Modi. What does the publication of the video mean for the case against Modi? For the CBI and ED cases against Modi, it is of little significance. Following the issuance of red notices against him, the UK had confirmed to India that he was in London. On the basis of this communication, CBI and ED had moved extradition requests through the Ministry of External Affairs (MEA). Junior External Affairs Minister V K Singh had informed Parliament in August 2018 that the extradition requests against Modi had been sent by a Special Diplomatic Bag to the High Commission of India in London. Until Modi comes back to India, the cases against him remain at the stages they are. Coming days ahead of general elections, the video could potentially embarrass the government. Once extradition requests are sent, the matter rests with the MEA. It is then up to the government to use its diplomatic heft with the UK to get the fugitive back. A video of Modi walking freely in the streets of London despite an Interpol red notice of arrest and extradition requests, makes for bad optics. It suggests that the government’s diplomatic efforts have not succeeded in persuading the UK to act against Modi. The video also brings the Nirav Modi issue back in the headlines. In the wake of the Pulwama attacks and the IAF airstrikes in Pakistan, the issue had been pushed on the back burner. The Congress has already issued a statement and attacked the government over the revelation. CBI and ED sources said on Saturday that they have no role in bringing back Modi until the process of his extradition begins in a London court. The MEA is likely to make a fresh push with the UK to begin the process as soon as possible. What is the case against Modi?